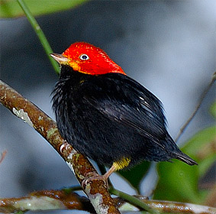 The male red-capped manakin. A native of Central American and northern South American forests, the bird is perhaps best known for the male's unusual courtship dances. Studied and filmed at high speed by Kimberly Bostwick, they were the subject of a PBS program, Deep Jungle: New Frontiers. The dance bears a striking resemblance to Michael Jackson's moonwalk. The red-capped manakin's courtship dance is a communication that emphasizes the dancer's assets, because the strenuousness of the dance demonstrates the health and vitality of the dancer. So it is with the communications activities of the job search. The content of the communication is important, but the style, energy and poise of the communicator are important, too. Prospective employers do want to hear what you have to say, but they also want to see and hear how you say it. Photo by Lois Knaggs courtesy Eagle-Eye Tours. Earlier in this series on finding work in tough times, we examined strategy, infrastructure and marketing. In this part we examine communications — written, telephone, digital and face-to-face. Even in tough times, the goal is to find a job that is the best fit you can find within the time you can afford to keep looking. To do that, you must let prospective employers know what they need to know, and you must learn from them what you need to know. Here are some tips for doing just that. Phone interviews are more common now because employers have so many candidates to choose from. Practice answering questions, record yourself, and listen to the recording. If the interviewer isn't a prospective supervisor or co-worker, fret not about the interviewer's manner or style. Reflect on the interview afterwards. What did you learn? Get tips from the Web. Convince the interviewer that you're able and likable. Practicing and reviewing video are very helpful, but preparing responses for anticipated topics is essential. Get tips for enhancing performance in face-to-face interviews. Customize your resume to every opportunity. Promote your assets, but don't try to defend liabilities. Get tips for resume writing. Most people peruse a company's Web site before interviewing, and some even read relevant news stories, but that's just a start. When preparing, use Web search or business and social networking sites to find whatever you can about the people who will be interviewing you. They'll be doing the same about you. Get a professional-sounding email address: Abraham.Lincoln[at]gmail.com, not HonestAbe271[at]gmail.com. If you already have social or business networking accounts in your name, clean them up to make them professional. Move any unprofessional content behind the "curtain" if there is one, or move it to another, more personal account. try to defend liabilities.been using a personal email address to contribute personal material to publicly visible Internet discussions, get a new address for job search purposes — something of the form <FirstName>.<LastName>[at]DomainName.com. This might be difficult if you have a common name, but try to avoid cuteness and numbers. Use your email signature to broadcast your value proposition. Beyond your contact information, add a line or two about your assets. Have a signature on all devices from which you send mail. Consider having different email signatures for different situations. For more on finding work in tough times, see "Finding Work in Tough Times: Strategy," Point Lookout for July 8, 2009; "Finding Work in Tough Times: Infrastructure," Point Lookout for July 15, 2009; and "Finding Work in Tough Times: Marketing," Point Lookout for July 22, 2009. Would you like to see your comments posted here? rbrenhHRIFJzUzJqHAkqkner@ChacqFxmWpNcqAEaBBdQoCanyon.comSend me your comments by email, or by Web form. I offer email and telephone coaching at both corporate and individual rates. Contact Rick for details at rbrenjxGPXFyCCibqxfJaner@ChacZdswBkmfteEbzaJcoCanyon.com or (650) 787-6475, or toll-free in the continental US at (866) 378-5470.